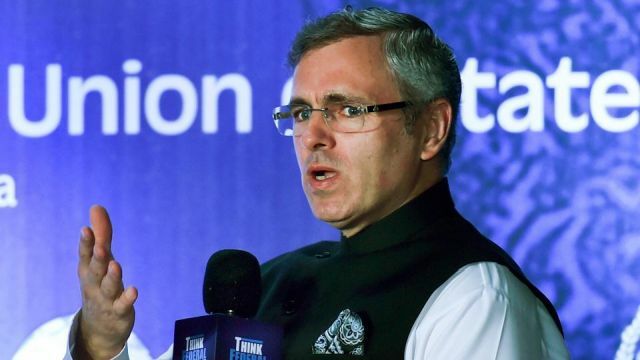 Kolkata, 29 July 2018 [Fik/News Sources]: Alleging that more youths from Jammu and Kashmir have been joining militancy in recent years, former Chief Minister Omar Abdullah on Saturday regretted that “not enough attention” was paid to the state during the recent no-confidence motion in Parliament. “In my tenure (as Chief Minister, 2009-2015) there were years when number of people who joined militancy was in twenties, while last year, it was 200 plus,” AAbdullah said at the Think Federal Conclave here. Slamming the BJP-ruled centre for its claim on the number terrorists killed in Jammu and Kashmir, he said the statistics was taken in isolation and not compared with the number of youths joining the militancy. Coming down heavily on the BJP-PDP coalition that ruled the troubled northern state from 2015 till last month, Abdullah said militancy was “reborn” in Jammu and Kashmir in 2015 when the alliance was formed. Refering to the no-confidence motion moved by the opposition in the Lok Sabha against the Narendra Modi government at the centre, he said: “Not enough attention was paid to Jammu and Kashmir’ during the debate. On centre-state relations, Abdullah said states have “little flexibility” to actually decide their own priorities in terms of spending funds from central schemes as these are coming in a “completely tied down” fashion. To buttress his point, he refered to the recent development package of Rs 80,000 crore sanctioned for Jammu & Kashmir, and said the executing agency was decided by the centre. “When you want to strengthen federalism, you need to strengthen the hands of elected representatives to make their own decisions,” he said. He also urged the removal of Indus Waters Treaty, saying it has denied Kashmiris the right to use their own water “without even consulting”. “Please, remove the Indus Water Treaty, let me hold and store water in my rivers the way I like. Let me build dams that allow me to generate electricity and I would not need single penny from the centre,” he said. He said there are “distinct differences” between the BJP or the NDA that his party had dealt with and the present leadership of the saffron party.